Asia cup 2016 will be started from 24th February. In the Asia Cup history, it is the first time to conduct all the matches on Twenty20 format. It may form the good results on the upcoming Twenty20 World Cup 2016 for all the Asia countries. The Association of Asia Cup is also made this format to concern about the World Cup. And the UAE was joined on the list after their win over Oman by 17 runs and makes the list as Five. 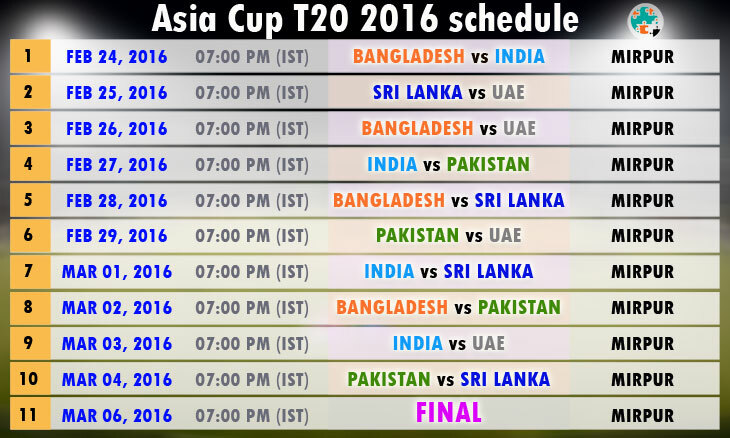 Here, the Asia Cup T20 2016 schedule is listed in text and image format. Timing: All the matches will be started at 07:00 pm IST. Asia Cup T20 2016 Match Live Scores available on Star Sports, ESPNcricinfo.